Intubating a SimMan robotic dummy. Peering through the lens of an Atomic Force Microscope. Examining the structure of a Life Flight helicopter engine. These types of experiences are something teens may dream of doing as professionals in the peak of their careers, but for 21 students from five different school districts around the Fox Chapel area, it was reality. The first year of the Western Pennsylvania Summer STEMM Academy was a huge success. 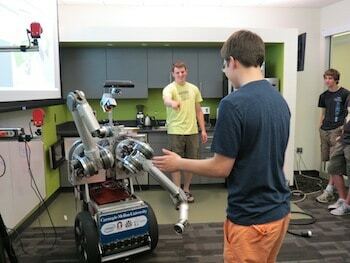 The student participants enjoyed exploring the amazing possibilities that exist for them in the field of STEMM (Science, Technology, Engineering, Math, and Medicine). The students later traveled to Oakland for a day at Carnegie Mellon University to research electrical engineering, computer technology, and robotics in more depth. The trip was coordinated by Dr. Jonathan Cagan, a CMU professor of Engineering. Through a partnership with CMU, students were able to take a detailed tour of a variety of labs on the campus. They shook hands with HERB (Home Exploring Robotic Butler) and even looked through the Atomic Force Microscope, which won the Nobel Prize for Physics in 1986. The day ended in a conference room with a CMU admissions counselor. Roman Cano, a Fox Chapel Area High School junior and engineering hopeful, said, “My favorite part was meeting with the admissions officer, since he gave me very exact, concise answers to what colleges are looking for.” Students left CMU with a broadened perspective of the latest developments in engineering and robotics as well as insider advice regarding admission to the university. It is not every day that one has the chance to see an open-heart surgery, or learn how to intubate a training dummy. But participants in the STEMM Academy did that as well. Robert Shuff, a senior at Fox Chapel Area High School, was amazed by the open-heart surgery experience performed by Dr. George J. McGovern at Allegheny General Hospital . “It was very eye-opening. I am so glad I did this; it was one of the coolest things I have ever done.” After the heart surgery, the students of the academy were led to the helipad by Mr. Eric Schmidt, the Outreach Development Coordinator for West Penn Allegheny Health System and LifeFlight, and examined a LifeFlight helicopter with three LifeFlight nurses and a retired Black Hawk pilot. 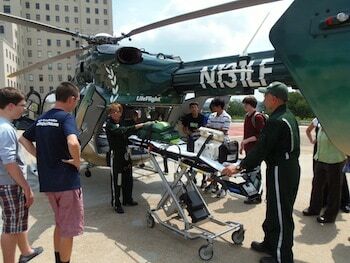 “The coolest part of the trip was seeing the med-helicopter and having a mechanical engineer explain the principles to us,” said Oliver Scigliano, a senior at Hampton High School, who is hoping to pursue aviation. Without participating in the STEMM Academy, students would not have been exposed to the numerous career opportunities that exist for them. 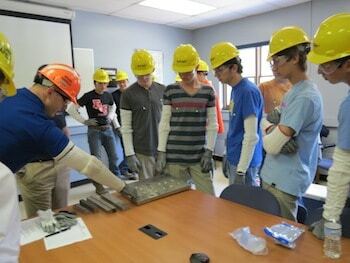 Students in the academy also learned about STEMM careers through guest speakers and roundtable discussions. The guest speakers included bioengineers Dr. Mark Redfern and Dr. William Federspiel of the University of Pittsburgh, Dr. Jonathan Cagan, an innovative mechanical engineer with Carnegie Mellon, radiation oncologist Dr. Ryan Smith, from the UPMC Cancer Institute, and Matt Butkovic, a Critical Infrastructure Protection Specialist in the CERT Program at the Software Engineering Institute. Each professional shared insight as to what their career paths entailed and the challenges they face. The roundtable discussions involved engineers and medical professionals from Penn State University, Westinghouse Electric Company, the University of Pittsburgh, UPMC Hospitals, Allegheny General Hospital, and Vincett Eye Care Associates. After the presentations, everyone gathered for refreshments and to speak with the experts informally. Through these one-on-one talks, the students networked with the professionals. Throughout the four weeks in the academy, students thoroughly researched the topics of medicine, technology, and engineering to help them complete their inquiry based projects which were presented during the final “Celebration of Learning.” The projects involved case studies for the student medical teams, programming for technology oriented students, and the design of airplanes for the student engineers. The technology team designed a computer game involving logic and chance, the medical teams discovered how to properly react when an epidemic strikes a city and also determined which type of artificial valve would be the best choice for a patient in need of a heart valve replacement. All teams presented their findings, theories, and discoveries and hopeful engineers competed to see which team’s plane would fly the farthest. The Western Pennsylvania Summer STEMM Academy will return during the summer of 2013 from July 8 to August 1. As to what can be expected for next year, the STEMM Academy’s director, Ms. Lisa Giguere comments, “The academy is a fantastic opportunity for students to explore the different strands of STEMM and will have an even richer array of choices next year.” Those interested can request an application by calling (412) 967-2430. Information may also be found on the Western Pennsylvania Summer STEMM Academy website (http://stemm.fcasd.edu).